LATE NIGHTS AND VOODOO: On the Buckcherry tour bus with singer Josh Todd in Houston, 2008. We met in 1999 after I was hired to write the band’s debut bio for DreamWorks Records. We’ve had a blast ever since! 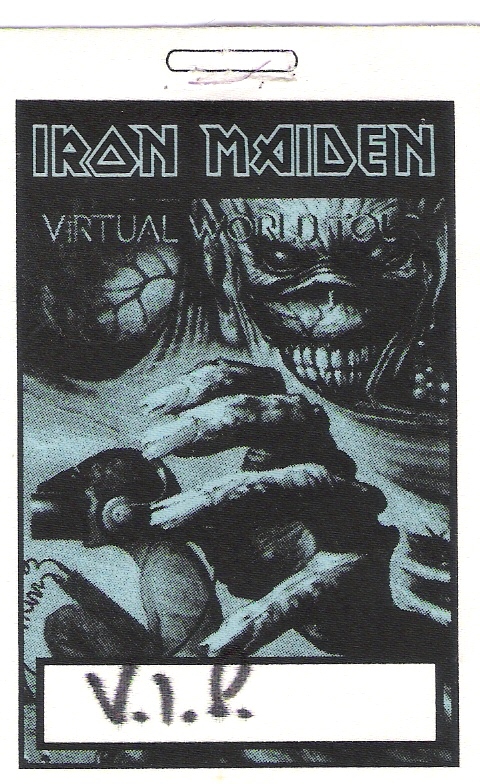 To mark the milestone of 2Fast2Die’s 100th post today (cue deafening applause), I decided to fulfill a long-standing reader request to interview site founder, Metal Dave. As a veteran music journalist and trivia-starved rock-n-roll geek, Metal Dave is usually the one asking all the incessant questions so, perhaps not surprisingly, he was a bit anxious to have the tables turned. Reminding him that turnabout is fair play, 2Fast2Die offered MD a beer and quickly learned what everyone else has known for decades: When it comes to rock-n-roll, this dude will not shut up! 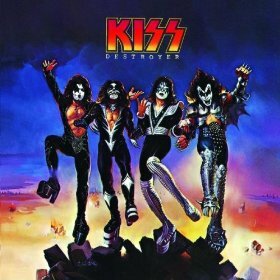 KISS “Destroyer” was the first album I bought with my own money when I was maybe 11 or 12. A childhood friend turned me onto it and I’ve been ruined ever since. KISS ruled my world as a kid and still has a place in my home and my heart. The album that is most enduring, however, is Iron Maiden’s “The Number of the Beast.” To me, that record is a masterpiece. The playing is superb, the singing is amazing, the lyrics are intelligent and the artwork is killer. My Nana actually bought it for me as a Christmas present when I was a teen. 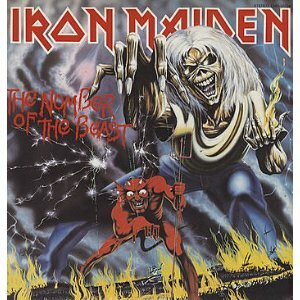 I find it ironic that my loving grandmother bought me an album called “The Number of the Beast” for Christmas. Anything for her grandson! KISS and the Plasmatics in 1983. 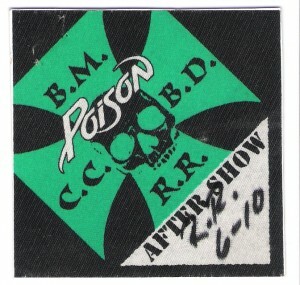 I was a late bloomer when it came to concerts, because my parents wouldn’t allow me to go. Today, I understand and thank them for caring enough to be protective. Anyway, back to the KISS gig, it was the “Creatures of the Night” tour and I remember being so pissed off that the Plasmatics replaced Riot as the opening act. At the time, I wanted nothing to do with punk rock. Look at me now! How’d you get started in music journalism? My first foray into journalism was actually working as a cartoonist for the campus newspaper at Southwest Texas State University (now Texas State U.). My cartoons got my foot in the door where I met reporters and editors. 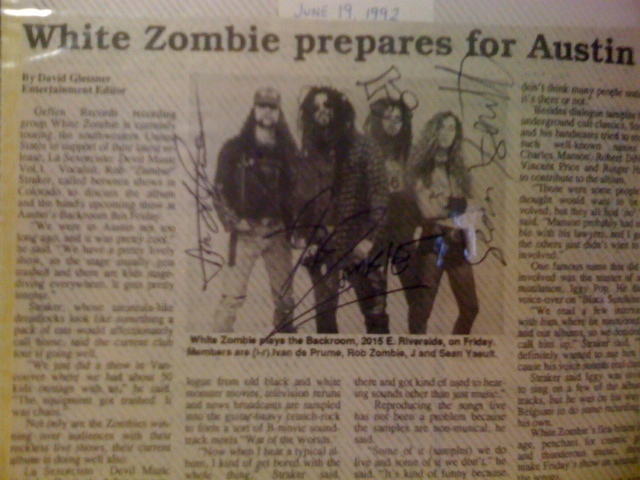 When a writing position became available, I started doing album reviews and interviews with bands like the Ramones, White Zombie, L7, Dee Snider and Faster Pussycat. Landing those kinds of interviews while still in college took a lot of perseverance and pestering on my part, but I was pretty determined. After college, I worked in newspapers for many years and freelanced music features on the side for a number of publications including the San Antonio Express-News, Metal Edge magazine, Texas Music magazine, Classic Rock mag, Austin Monthly, Houston Press and some others. I also once wrote a profile on Austin music and nightlife for SPIN magazine as part of their SXSW coverage. That was a pretty big deal for me. Wow. There are so many. I’ve been doing this for nearly 20 years. 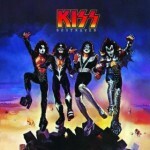 Obviously, interviewing Gene Simmons, Paul Stanley and Peter Criss was an honor because the original KISS changed my life. I’m also pretty proud of having interviewed the Ramones, David Lee Roth, Eddie Van Halen, Joe Perry, David Bowie, Motley Crue, Lars Ulrich, Ronnie James Dio, Iron Maiden, Judas Priest, Malcolm Young of AC/DC, Lemmy, Ozzy. I could go on all day. These people and many others have touched my life through their music, so talking to them is always an honor and a thrill. Who are some interviews that have escaped you up to this point? Steven Tyler is my favorite singer and obviously a true rock-n-roll character who would certainly be a great interview. Hasn’t happened yet. Ditto Keith Richards, Iggy Pop and Ace Frehley. I met Iggy once behind a club in Houston and got a few autographs, but I’ve never properly interviewed him. 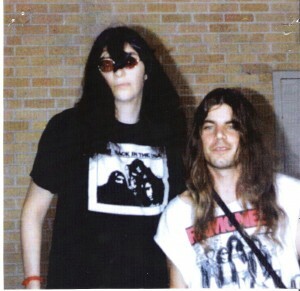 I’ll never forget he was wearing sunglasses at 3 a.m.
Glenn Danzig was a bummer. 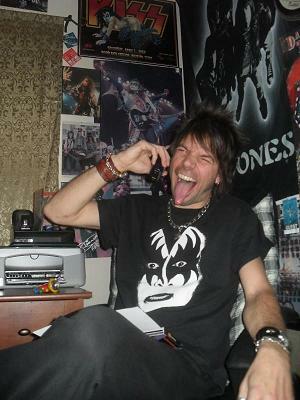 I love his early music and was stoked to be on the phone with him, but he sounded completely bored. I pride myself on asking interesting questions, but he just couldn’t be bothered. 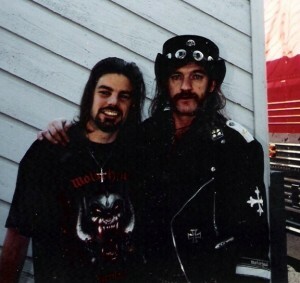 Another time I had to wait four freakin’ hours for Lemmy (left) to finally call, but of course, he made it totally worth the wait. That guy is a fabulous interview. One of the best! Another time I was completely embarrassed when I took the phone too close to my recorder and sent a squall of piercing feedback into the ear of poor Ronnie James Dio. Of course, in his usual gracious manner, he made a joke of it and moved on. A true sweetheart, that Ronnie. Do you ever meet these people in person? Sure. Not all of them, but some. My interviews usually serve as advance coverage to promote an upcoming concert in my area, which means the bands call me while en route to a tour stop near my location. Glenn Tipton from Judas Priest once called me from Romania. Vivian Campbell from Def Leppard called from his home in Ireland. As far as meeting people, I haven’t met KISS or Ozzy in person, for example, but I’ve had plenty of backstage fun with the Ramones, Poison, Buckcherry, Motorhead, Dio (right), Joan Jett, Down, Slayer, Iron Maiden, Anthrax, Zakk Wylde … I’ve been lucky enough to enjoy my share of hospitality. I actually got to sing onstage with Poison and Buckcherry. Those were crazy, memorable moments for sure. 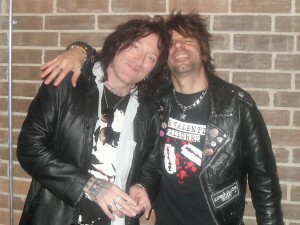 Another good one was Ginger (left) from the Wildhearts who is now in Michael Monroe’s band. A few years ago, he invited me to Willie Nelson’s recording studio where I ended up voicing an outro to a song on one of his solo albums. I stayed at the studio with him for nearly two days. You could say we lost track of time. Do you have a favorite music journalist? I’d have to say David Fricke (right) from Rolling Stone. I’ll read anything that carries his byline, because he does such a great job of balancing information with “color,” meaning he’s credible, yet still entertaining to read. Some of his descriptive phrases are pure genius. A lot of times, a writer can go overboard trying to be clever, which often leaves his or her credibility in question; or they can go to other extreme and be so matter-of-fact, that they come off as being “dry” or rigid and not fun to read. Fricke is the best of both worlds, in my opinion. With Fricke, you learn a lot about the subject and you’re onboard until the very last word, because he entertains you with his wordplay. When the writer becomes part of the story because he or she is so good at telling it, that to me is an unusual talent. I think the best writers inject some of their personality into the story without hijacking it or being intrusive. It’s a very, very fine line and it’s very tough to do, but in my opinion, Fricke nails it more often than most. Are you still writing for newspapers and magazines? The world of print media has changed radically in the past five years. Unfortunately, most of the print outlets I’ve worked for in the past no longer have freelance budgets to pay guys like me. Interviewing rock stars and getting published may seem glamorous and fun, but at the end of the day, it’s a lot of self-inflicted work when you consider I have a full-time job, a 3-year-old son, a wife and a house to take care of. Hell, I barely have time to buy groceries, let alone be inspired and creative at the end of a busy day. Plus, I’m a total stickler and will agonize for hours over a single sentence or paragraph. Just ask my poor wife! Freelancing never paid well to begin with, but these days the return-on-investment is completely upside-down — especially if you’re a good writer with a talent for producing quality stories that editors appreciate and readers actually enjoy. In a lot of ways, it’s a thankless art as far as money’s concerned. But again, you write for yourself and your readers, not for the paycheck. Hence, the creation of 2Fast2Die? Exactly. I still have a need to write and I still have a love for music, so if I’m not going to get paid for my efforts elsewhere, then I’m at least going to pursue my passion on my own terms. I guess you could say I’m semi-retired from freelancing, but always open to offers. Otherwise, I’m full-time with 2Fast2Die and enjoying the flexible deadlines. Where did the name 2Fast2Die come from? It’s a combination of album titles from two of my favorite bands, the Ramones and Motley Crue. It’s Motley’s “Too Fast for Love” slammed together with the Ramones’ “Too Tough to Die.” Plus, I thought it had a nice rock-n-roll ring to it. Yeah. If you like the site, please click on the red numeral at the top right corner of each post and leave a comment. You can also scroll back through this post and click on the hyperlinks for more stories about the highlighted bands. I also have a 2Fast2Die facebook account (profile pic ) where the blog content is duplicated and extra info is regularly posted. Please “like” and “share” with your friends. Other than that, thanks for reading. Oh, one last thing … you got another beer? Great stuff, man. Congrats on #100. Looking forward to a thousand more….if your wife and your schedule allow. Great to see a look back at some of your life shaping rock n roll memories. Cheers to you Metal Dave! Awesome. How was it to be on the other answering the questions? Keep up the great work brother. I expect 100’s more. Thanks, Dave. You were one of the first and I appreciate the fact that you’re still reading. Cheers! Can’t wait for #666 you beast!! Takes one to know one, Venom! MD is an amazing dude, to say the least. One of my favorite dudes walking around on this planet. About time we had a ‘yakking with’ post on him. Keep it up, 2F2D! This is a treasure trove of a Rn’R archive! Dammit Dave! I was working up a questionnaire with you for my site as well! Ha! Congrats on the 100th. It feels good getting these RnR happenstances out of our heads sometimes, eh? Can’t wait to read the next 100. Dave we need the book! so many great stories. Many congrats on 100 here to many more. 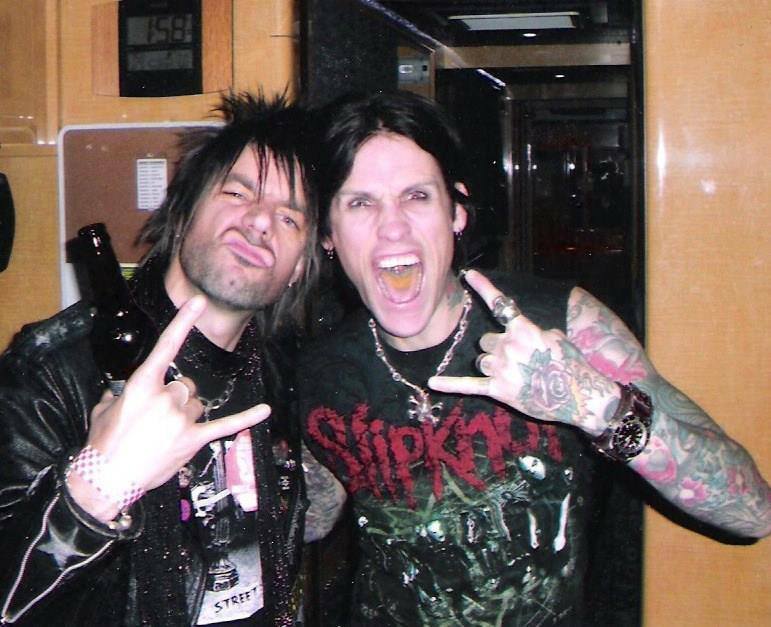 I think one of your best interview’s was the Buckcherry one you did for Classic Rock Magazine, must have been around 2006. So many that i’ve read loved.. The Lemmy one from few year’s ago was killer..
David Lee Roth from 2002 Sam and Dave tour that had us all rolling on the floor, when you played me the tape..
Keep it up, yeah that book awesome read, if get chance to do it. Thanks for all your support Stevie Manchester! I didn’t know you went to the Kiss Plasmatics show. 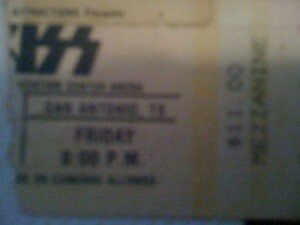 I was there with floor seats and I was the only one the next day wearing a Plasmatics shirt at school. (Coup De Etat with Wendy on the front and a mohawked skull on the back) I was in the 8th or 9th grade, still in middle school. She sawed a guitar in half, broke a tv that was on a ladder with the local news showing and went up in a cherry picker. Let’s not forget the stratigically placed electrical tape. Killer body with a sandpaper face, I was in love. Let’s just say that was a life changing show that got me into the fringes of rock n roll.